Part of the joy of gardening is having fresh herbs available out the back door year round. 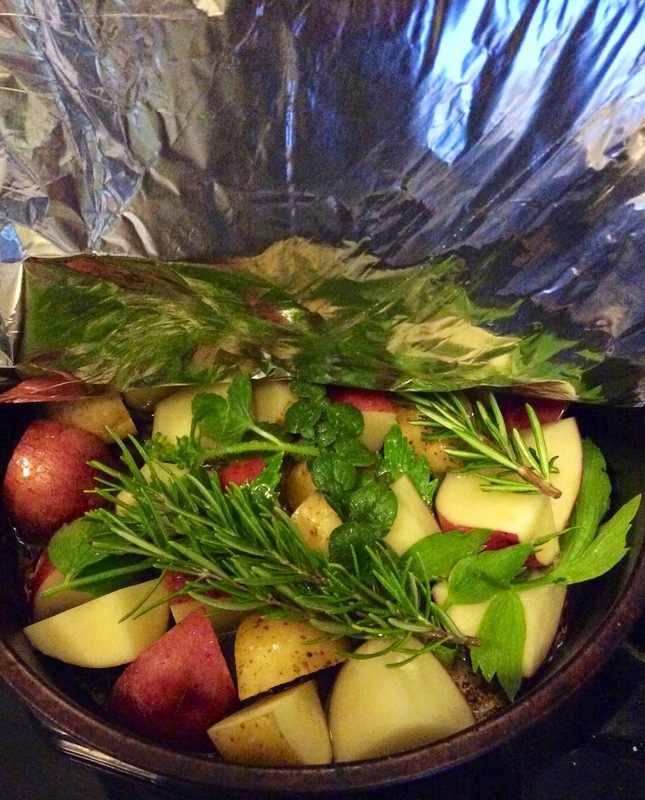 Part of the joy of having fresh herbs out the back door year round is what a sprig of rosemary, some sacred basil, and a bit of lovage's celery-tasting goodness will do for some quartered red and white potatoes along with some salt and olive oil. 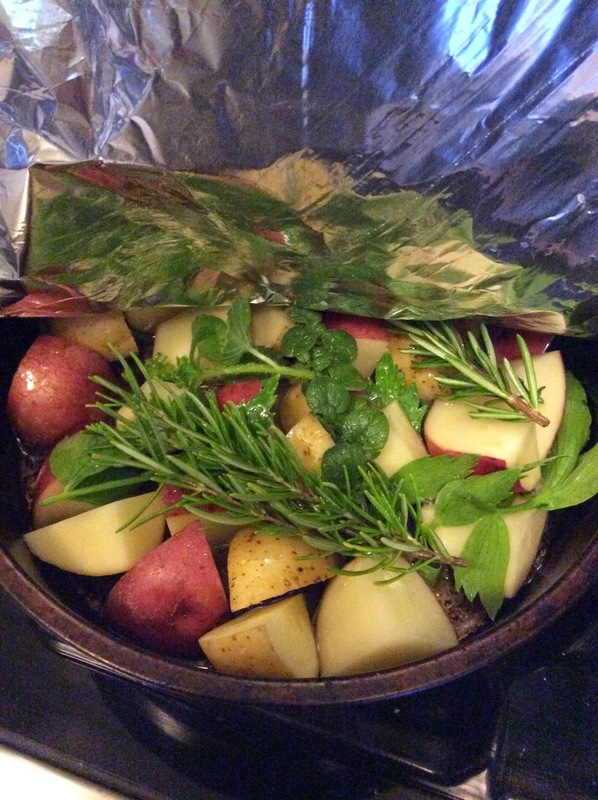 When I was a kid herbs came out of a jar (four kids and the sixties/seventies will do that to a mom) and herbed potatoes then were nothing like I'm eating now. The garden has also come to the rescue of tofu dishes like the one below. *Before cubing the tofu, wrap it in three paper towels and put it between two plates with a bowl of water or other weight on top for 30 minutes or so to get some of the water out. **I used a bottled ponzu sauce but you can make your own by combining soy sauce, rice vinegar, and Yuzu or lemon juice. The stuff that I used also contained barley malt so you could add a tiny bit of sugar or maple syrup for sweetness but I don't think that you'll miss it. 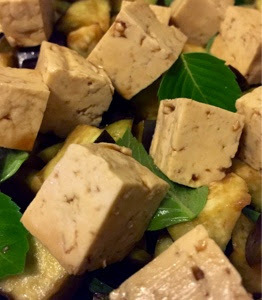 Marinate the eggplant and tofu in a mixture of ponzu sauce, mirin and chili oil for 30 minutes to an hour. In a small roasting pan or other dish (I use a cake pan) use one tablespoon of oil to coat the bottom of the pan and then chop the lemongrass to cover the oil. 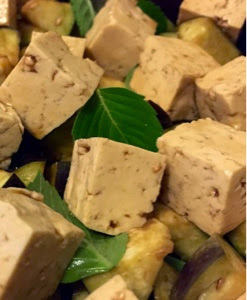 Remove the tofu and eggplant from the marinade and cover the lemongrass. Top the eggplant and tofu with sacred basil leaves and drizzle the remaining oil over it all. Cover with a lid or foil and roast at 350 degrees for 20-30 minutes until the eggplant is softened. Serve with your rice of choice. You could just use lemongrass here as I'm not sure that the basil flavor come through as much as the lemongrass shined. Next time I might try putting the basil into the marinade. Either way, this is one flavorful dish that'll make you thankful that you had fresh herbs on hand.